Front Street & Olney Ave., Philadelphia, Penna. BUREAU OF SHIPS • NAVY DEPARTMENT • WASHINGTON, D. C.
This instruction book presents all information necessary for installation of Sliding Dog Lever Type, Rotating Dog Lever Type and Rotating Dog Rack and Pinion Type doors and their maintenance by shore activities and forces afloat. Through its use these doors can be kept in smooth, easy and efficient operating condition. CL 42-49, 51-58, 60, 62-67, 80-83, 86-87, 89-98, 101-118, 144-147. (1) Sliding Dog Lever Type Door, Fig. 1, page 1, and Fig. 2, page 2. (2) Rotating Dog Lever Type Door, Fig. 1, page 1, and Fig. 4, page 4. 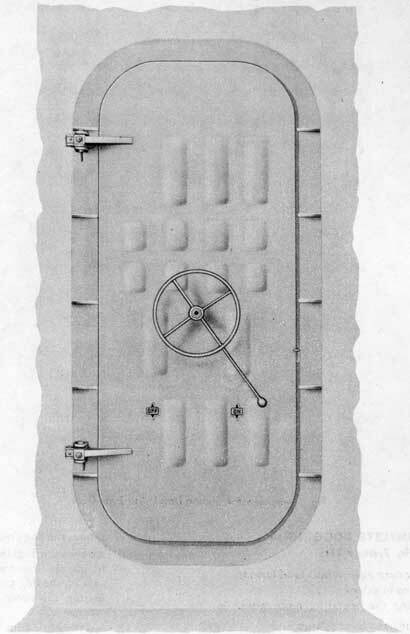 (3) Rotating Dog Rack and Pinion Type Door, Fig. 6, page 6, and Fig. 8, page 8. All of the doors operate quickly, easily and efficiently when correctly installed and adjusted, and when in dogged position make compartments tight. 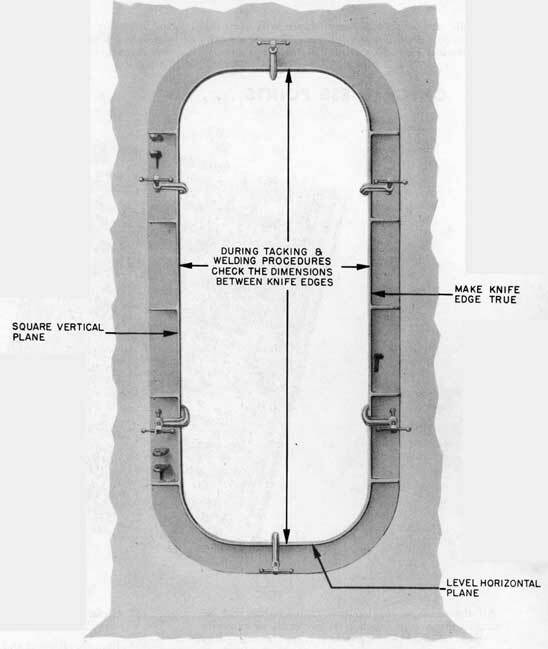 All illustrations of replacement operations refer to the 26" x 66" Doors. The doors are made in various sizes and combinations of dogs, depending upon pressure requirements and bulkhead door openings. Fig. 1-Outside view of Sliding Dog and Rotating Dog Lever Type Doors. This door is dogged or undogged by a 3/4 turn of the hand lever, with minimum power requirement. The dogs are fully extended over the wedge before the final action forces the dogs down on the wedge. Fig. 2-Inside view, Sliding Dog Lever Type Door. (b) releasing the operating mechanism. (g) forcing knife edge into rubber gasket. 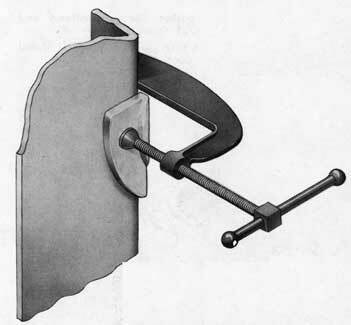 (h) The hand lever is held in final position by the toggle arm spring. Fig. 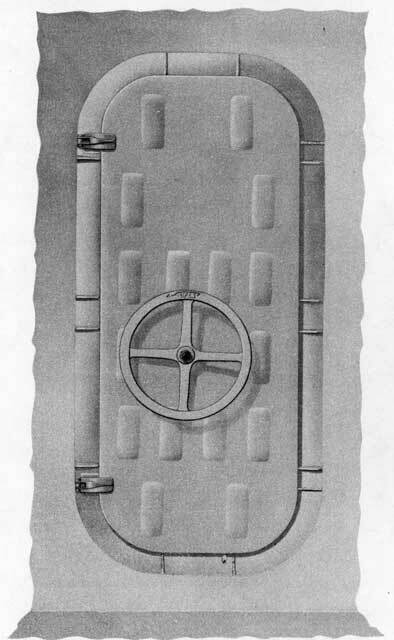 3-inside view, Sliding Dog Lever Type Door, showing shell with main assemblies pulled out. On this type of door the ease of operation is obtained through the toggle arrangement of the center mechanism and the use of roller type dogs. Fig. 4-Inside view, Rotating Dog Lever Type Door. (e) forcing knife edge into rubber gasket. (f) The toggle arm spring acts as a limit stop that holds the hand lever in final position. Fig. 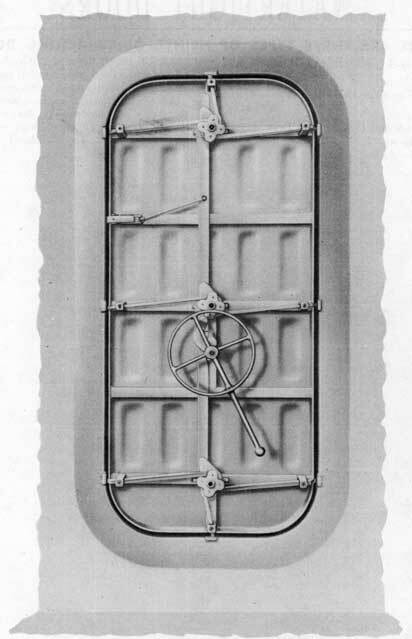 5-Inside view, Rotating Dog Lever Type Door, showing shell with main assemblies pulled out. through the use of a rack and pinion mechanism and roller type dogs. 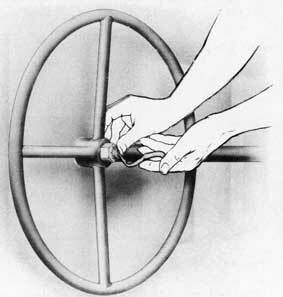 Approximately two turns of the hand-wheel completes operation. Fig. 6-Inside view, Rotating Dog Rack and Pinion Type Door. (b) lifting the pawl from the teeth of the pinion, unlocking the mechanism. (f) forcing knife edge into rubber gasket. Fig. 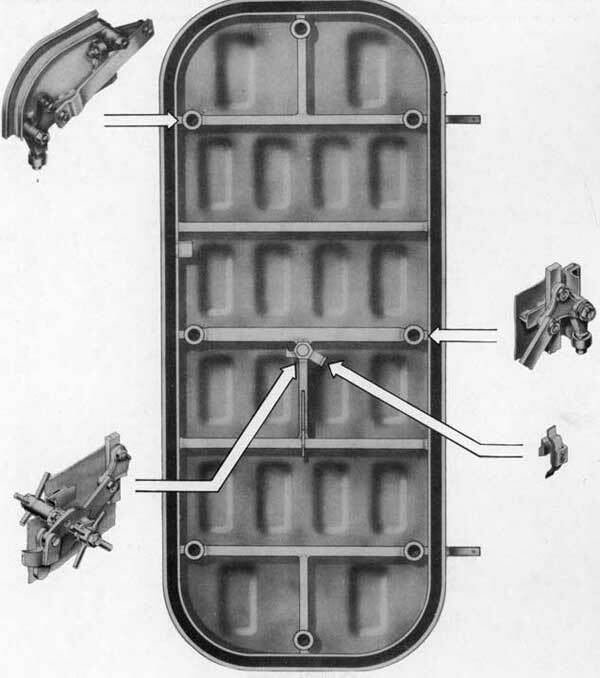 7-Inside view, Rotating Dog Rack and Pinion Type Door, showing shell with main assemblies pulled out. The test pressures for the doors range from 5 to 25 pounds per square inch. The pressure factor of the doors depends upon the type and number of dogs and their location; the size of the door; the size, number and spacing of the structural ribs of the door panel, and the number of reinforcements in the door frame. Fig. 8-Outside view of Rotating Dog Rack and Pinion Type Door. The door is fabricated to a prescribed degree of accuracy and must be installed with careful attention to prescribed procedure. (1) Straighten the bulkhead around the edges of the door opening. (2) Check with a straight edge across and along the edges of the bulkhead opening, to the exclusion of a 3/32" feeler. (3) Clamp door frame in place, center frame, square up to vertical knife edge and level up to horizontal knife edge. (4) Using arc weld, tack door frame in place following proper tacking procedure. During tacking, check dimensions between knife edges. (5) Permanently arc weld door frame in place following proper welding procedure. During welding, check knife edges for distortion. (6) With a straight edge, check knife edges to the exclusion of a 1/16" feeler. If necessary to straighten, use soft mallet. (7) Lift door onto hinges, see Figs. 11 and 12, page 11. (8) Chalk-test knife edge contact on rubber gasket. (9) Adjust rubber gasket compression, see Figs. 15 and 16, page 13. For welding corrosion-resisting steel frame to any bulkhead, use only 25-20 welding electrode, Grade IV-DC BUSHIPS Ad Interim Specification 46E4 (INT) of 15 April 1944 and amendment 2 of 15 August 1944 or later issue. For medium carbon steel frame, use medium steel welding electrode BUSHIPS Ad Interim Specification 46E3 (INT) of 1 November 1945 or later issue. All welding shall be in accordance with the applicable requirements of General Specifications, Appendix 5, Parts I and II. When installing the Sliding Dog Lever Type Door, the bulkhead must be braced from bulkhead stiffeners to door frame along the vertical sides. This is done so that the deformation of the bulkhead will not produce a change in the size of the door opening sufficient to permit the dogs to slide off the wedges when subjected to heavy loads. Door frame in place ready for tacking and welding. Periodic inspection and maintenance will keep the Quick Acting Doors watertight and insure smooth, easy operation. Each door should be inspected weekly, and necessary maintenance should be completed without delay. A weekly routine of inspection, maintenance and repairs, carried out systematically is desirable. All the materials for routine maintenance will be found in ships stores: carbon-tetrachloride or kerosene and paint thinner for removing grease, excess paint and other foreign matter, steel wool, 00 emery cloth and some clean wiping rags. (1) Wipe off all dirt, grease and foreign matter with a wiping cloth dampened with carbon-tetrachloride or kerosene. (2) Scrape rust off all parts of the door. (3) Clean contact surface of dog and dog wedge with steel wool and wipe both surfaces with an oily cloth, leaving a thin film of oil. (4) Clean rust and paint off knife edge contact surface with 00 emery cloth. (5) Remove all paint and rust from rubber gasket. It should be clean and pliable. (6) Examine all moving parts for excess wear or damage. If necessary, REPLACE NOW. (7) Operate door and check for smooth and positive dogging action. (8) Check compression between knife edge and rubber gasket. If adjustment is necessary, see Figs. 15 and 16, page 13. The wedges on all doors are the inclined surfaces, or points, where the dogs exert the pressure that forces the knife edge into the rubber gasket forming the watertight seal. Fig. 10-Wedge ready for welding, Rotating Dog Type Door. First-Chip old wedge from door frame. Second-Chip clean all old weld metal from wedge seat on frame. Third-Hold wedge in place with "C" clamp, see Fig. 10. Fourth-Using arc weld, tack wedge in place. Dog door and check for proper wedge position. Fifth-Permanently weld wedge in place. Sixth-Check rubber compression all around door, see Figs. 15 and 16, page 13. NOTE: In tacking and welding, follow proper procedure (see welding note, page 9). 1.-The conventional type with the elongated hole in the hinge blade. 2.-The Non-Sag Hinge which is designed to minimize sagging and misalignment of the door and to reduce frictional wear on the hinge pin. (1) File off peen of pin and remove hinge pin collar. (3) Slide washer from between hinge pad and hinge blade and inspect for scoring or excessive wear. Fig. 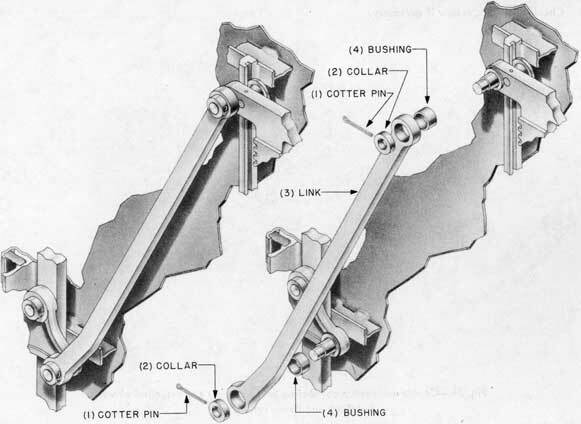 11-Hinge, assembly and exploded views, conventional type hinge. (3) Replace washer between lower hinge pad and hinge blade. (2) Line up hinge pin holes and insert hinge pin. (1) Set new collar in place and peen over hinge pin. Test for free swing of door. Fig. 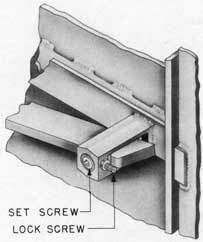 12-Hinge, assembly and exploded views, Non-Sag Type Hinge. The rubber gasket makes the door watertight where the door gasket meets the door frame knife edge. The outer gasket retaining edge is part of the door panel, minimizing the danger of water leakage at this point. The inner gasket retaining edge is a bulb angle of one section which acts as a stiffener around the door, thus minimizing bulge or distortion of the door panel under water pressure. 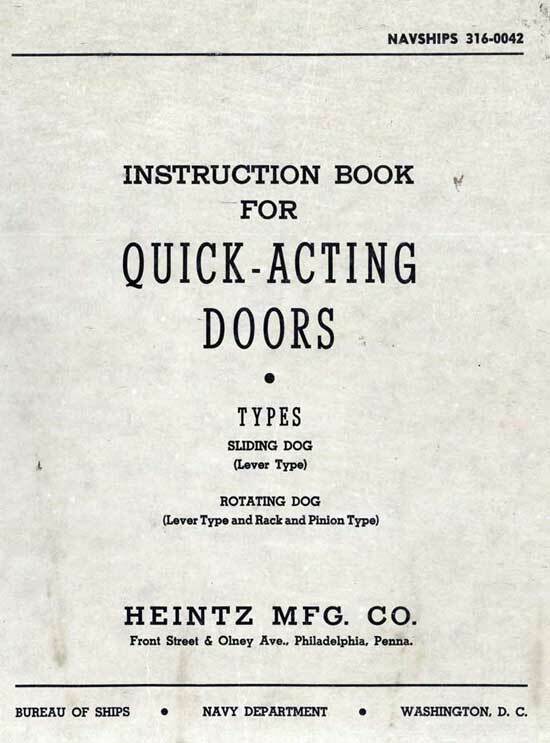 The rubber gasket and method of replacement are the same for all Heintz Doors covered in this manual. (1) Gasket joint should be at center top of door. (2) Wet gasket with water and it will slide in place easily. (3) Do not stretch rubber gasket when inserting in seat. (4) Cut one inch too long, pull out part way, reinsert from cut end, forcing excess inch in place. First-Insert screw driver at joint and pry out enough for hand-hold, pull out rest of gasket by hand. Second-Clean out all foreign matter around gasket seat. Third-Insert new gasket, use soft hammer and wooden wedge (see NOTE above). Fourth-Check to be sure gasket is properly seated in retainers all around door. Fig. 13-Rubber gasket replacement, all Heintz Quick Acting Doors. The packing is the medium for making the door watertight at the point where the outside handwheel or hand lever shaft pierces the door. 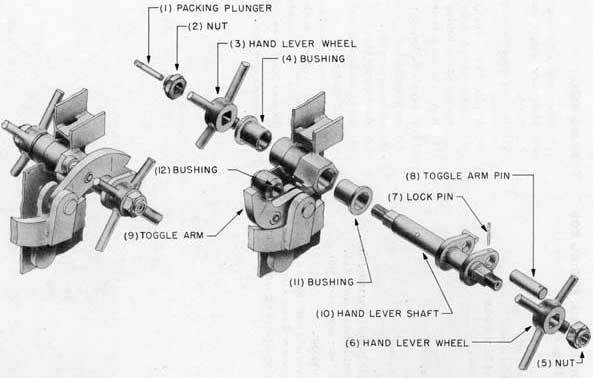 First-Remove packing plunger from outside operating lever (handwheel) shaft. Second-Insert stick of packing. If stick packing is not available, roll bulk packing into a string form and pack into hole of shaft (use N.D. Spec. 33P29 Symbol 1425). Third-Replace packing plunger and screw flush to shaft surface. The compression between the knife edge and rubber gasket may be varied by the compression adjustment on each dog on all Heintz Doors. 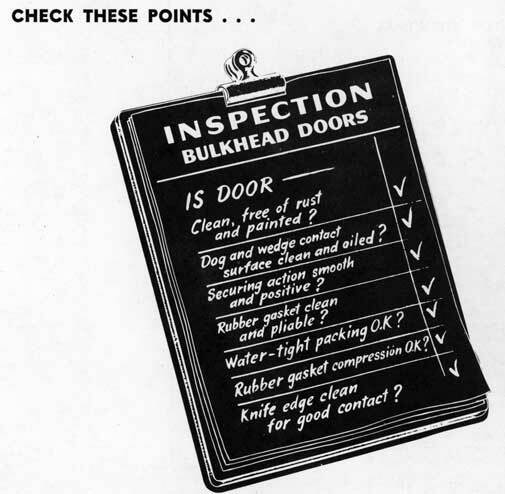 To determine proper preliminary adjustment, hold a piece of paper under dog, between knife edge and gasket, close door and hold in closed position by hand. Do not dog door. Adjust compression so that paper may be pulled from between gasket and knife edge with a maximum drag. After preliminary adjustment has been completed for each dog, fully dog door and adjust each dog for a 1/8" depression of the knife edge onto the rubber gasket. The 1/8" depression may be determined by measuring a 1/8" pull-in of the door to the frame. Use a depth gauge or combination square and straight edge to measure from outside door panel to frame. First-Back lock screw out part way, using Allen wrench. Second-Turn dog spindle nut clockwise for more compression, counter-clockwise for less compression. Third-Determine proper compression adjustment (see above). Fourth-Tighten lock screw to lock compression adjustment. Fig. 15-Rubber gasket compression adjustment, Sliding Dog Lever Type Door. Second-Turn set screw, with Allen wrench, clockwise for more compression, counter-clockwise for less compression. Fig. 16-Rubber gasket compression adjustment, Rotating Dog Type Doors. The bushings on all doors are made of oil-impregnated metal and are self-lubricating; they act as bearings for the moving parts. During the replacement of any part the inspection of the bushings is regular procedure. Any sign of failure indicates the necessity of replacement. Inspect bushing for cracks, breaks, wear or loose fit. Remove bad bushing by driving out, using soft hammer and a piece of bar stock. Insert proper bushing; see spare parts list. Drive bushing home, using soft hammer and bushing set. The hand lever shaft on the Lever Type Door is a rugged part and ordinarily needs little or no attention. However, it may be damaged during shifting of cargo or equipment, which will necessitate its replacement. (2) Remove outside hand lever nut. (3) Slide off outside hand lever wheel. (4) Remove bushing, inspect and renew if necessary. (5) Remove inside hand lever nut. (6) Slide off inside hand lever wheel. (7) Remove lock pin from toggle arm pin. (8) Remove toggle arm pin. (9) Pull toggle arm over. (10) Replace new hand lever shaft. (11) Remove bushing, inspect and renew if necessary. (12) Inspect two toggle arm bushings-renew if necessary. (9) Slide toggle arm in place. (8) Replace toggle arm pin, line up lock pin holes. (7) Replace lock pin in toggle arm pin. (6) Replace inside hand lever wheel. (5) Replace inside hand lever nut and pull tight. (3) Replace outside hand lever wheel. (2) Replace outside hand lever nut, pull tight. Insert new packing, see page 12. Fig. 17-Replacing hand lever shaft, Sliding Dog Lever Type Door. (10) Remove hand lever shaft. (12) Inspect two toggle arm bushings, renew if necessary. (5) Replace inside hand lever nut. (2) Replace outside hand lever nut. Fig. 18-Replacing hand lever shaft, Rotating Dog Lever Type Door. 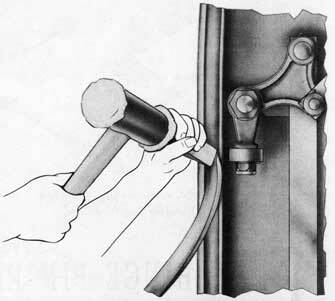 The toggle arm is the link that rotates when the hand lever is turned. It moves the connecting rod up and down, actuating the dogs. (1) Remove hand lever nut. (2) Slide off hand lever wheel. (3) Force down lap of lock washer. (10) Remove cotter pin behind operating link. (11) Remove washer behind operating link. (12) Remove lock pin from toggle arm pin. (13) Remove toggle arm pin. (14) Remove toggle arm and bushing as a unit. (15) Check bushings, renew if necessary. (16) Inspect bushing in operating link, renew if necessary. (15) Insert bushing in new toggle arm. (14) Hold new toggle arm and bushing unit in place. (13) Replace toggle arm pin, lining up lock pin holes. (12) Replace lock pin in toggle arm pin. (11) Connect toggle arm to operating link and replace washer behind operating link. (10) Replace cotter pin behind operating link. (4) Replace spring stud and pull tight. 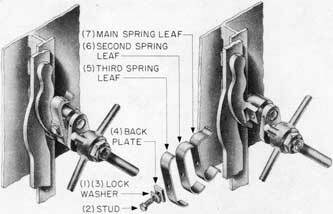 (3) Force lap of lock washer on spring stud. (2) Replace hand lever wheel. (1) Replace hand lever nut and pull tight. Fig. 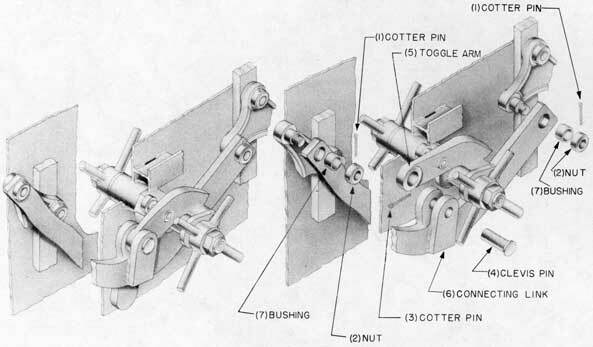 19-Toggle arm, assembly and exploded views, Sliding Dog Lever Type Door. Fig. 20-Replacing toggle arm, Sliding Dog Lever Type Door. (3) Remove lock pin from roller pin. (4) Remove roller and roller pin as a unit. (5) Remove cotter pin from toggle arm clevis pin. (6) Remove toggle arm clevis pin. (10) Check bushing, renew if necessary. (10) Replace bushing in new toggle arm. (9) Hold new toggle arm in place. (6) Hold toggle arm in position and replace toggle arm clevis pin. (5) Replace cotter pin in clevis pin. (4) Replace roller and roller pin unit, line up lock pin holes. (3) Replace lock pin in roller pin. (1) Replace hand lever nut. 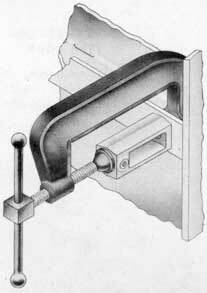 The toggle arm spring, on both lever type doors, acts as a cushion stop and holds the hand lever in extreme position. (1) Force down lap of lock washer. (2) Remove stud from spring assembly. (2) Replace stud in spring assembly. (1) Bend lap of lock washer up on side of stud head. Test for stop and holding action. (1) Remove two machine screws from spring assembly. 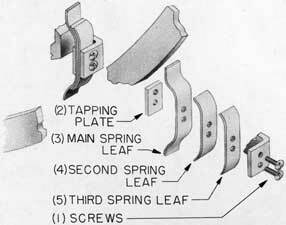 (5) third spring leaf (backing plate). (1) Replace two machine screws in spring assembly and set up tight. Fig. 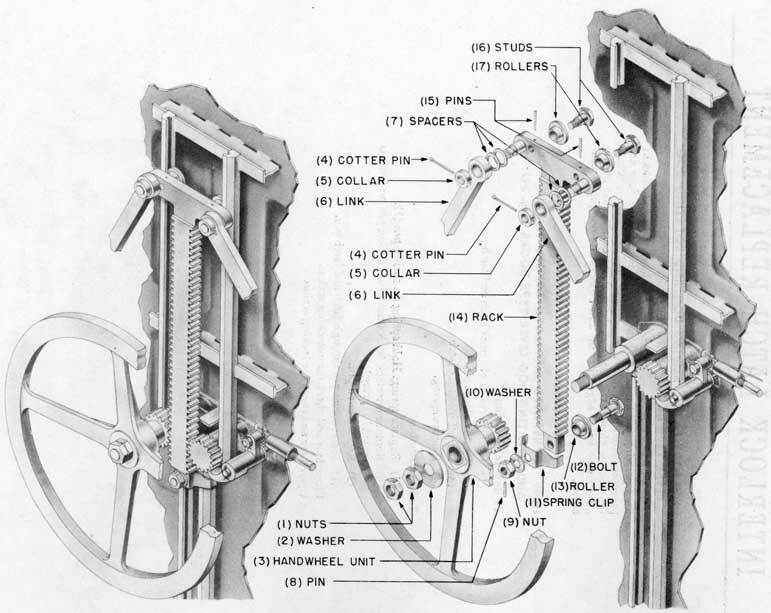 22-Toggle arm spring, assembly and exploded views, Rotating Dog Lever Type Door. The toggle arm roller on the Rotating Dog Lever Type Door acts as a booster to aid the operating mechanism get over the hump of the operation in dogging the door. (1) Remove lock pin from roller pin. (3) Hold new roller in place. (2) Insert roller pin and line up lock pin holes. (1) Replace lock pin in roller pin. Fig. 23-Replacing toggle arm roller, Rotating Dog Lever Type Door. The Dog on this type door slides out on the wedge. 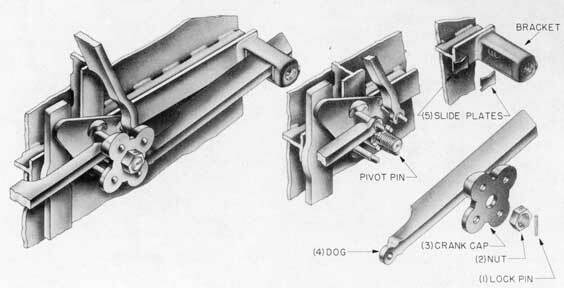 When dog bar is fully extended, the cam on the operating crank raises the inner side of the dog bar, forcing the outer end down on the wedge. This exerts pressure between the knife edge of frame and rubber gasket, creating a watertight seal. (1) Remove lock pin from dog spindle nut. (2) Remove nut from dog spindle. (3) Pry off operating crank cap. (4) Lift dog from pivot pin and pull from out of dog bracket. (5) Remove two slide plates from dog bracket. (5) Hold in place two slide plates in dog bracket. (4) Slide new dog in bracket and insert inner end of dog on pivot pin. (3) Replace operating crank cap. (2) Replace nut on dog spindle, line up lock pin holes. (1) Insert lock pin through dog spindle nut. Test for smooth, positive action. Fig. 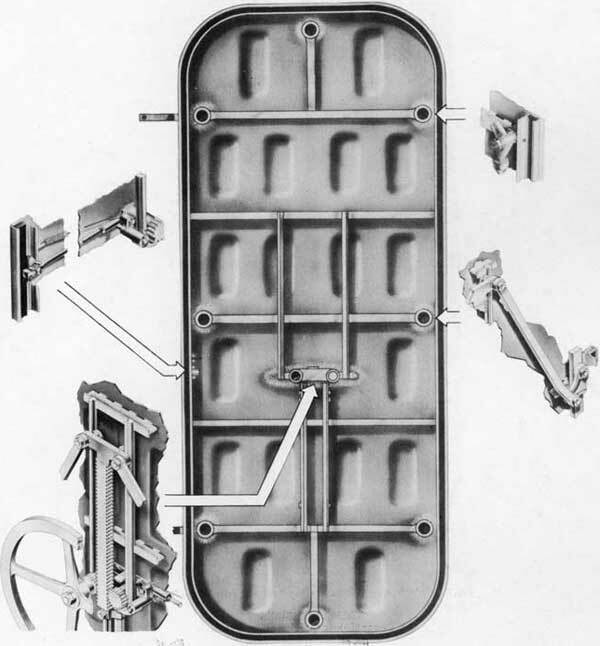 24-Dog, assembly and exploded views, Sliding Dog Lever Type Door. Fig. 25-Dog, assembly and exploded views, Rotating Dog Lever Type and Rack and Pinion Type Doors. The dogs on the Rotating Dog Type Doors are pulled around on their pivot by the linkage system and rolling up on the wedge create the pressure at the contact point of the knife edge and rubber gasket. (2) Remove round nuts (collars). 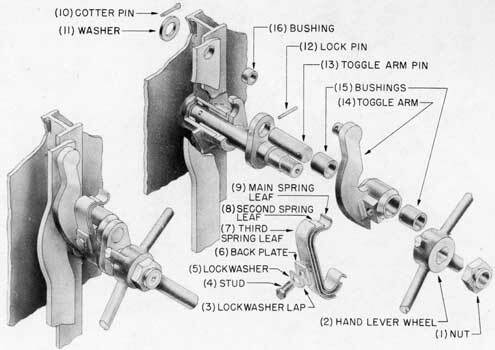 (3) Lift off connecting rod (on lever type door, loosen outside hand lever nut and pull center assembly part way out, on inner side of door, sufficient to lift connecting rod from dog). (5) Remove lock pin from dog roller nut. (6) Remove dog roller nut. (7) Remove dog roller washer. (8) Remove dog roller and bushing unit, inspect bushing and renew if necessary. (9) Remove lock pin on dog spindle nut. (10) Remove nut on dog spindle. (11) Remove dog and bushings as a unit. (12) Inspect three bushings and renew if necessary. (11) Replace new dog and bushings as a unit. (10) Replace nut on dog spindle, line up lock pin holes. (9) Insert lock pin in nut on dog spindle. (8) Replace dog roller and bushing unit. 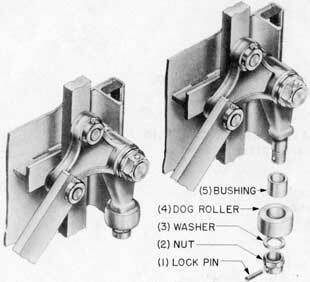 (7) Replace dog roller washer. (6) Replace dog roller nut, line up lock pin holes. (5) Insert lock pin in dog roller nut. (3) Replace connecting rod (on lever type door, push center mechanism back in place, after connecting rod is attached to dog, and tighten outside hand lever nut). (2) Replace round nuts (collars), line up cotter pin holes. 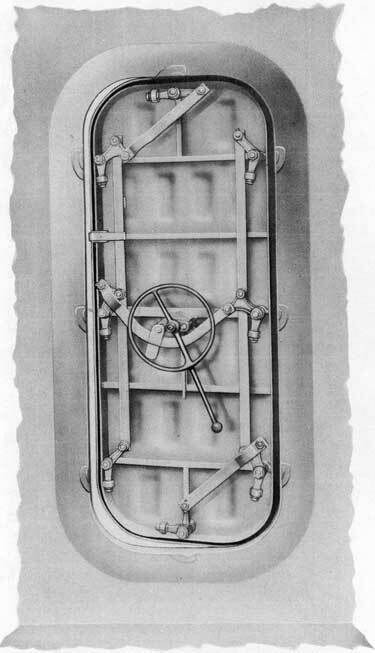 The rotation of the operating crank extends the dogs over the wedge, at the same time raising the inner end of dog bar, forcing the outer end down on the wedge. (1) Remove lock pin from crank spindle. (2) Remove nut from crank spindle. (4) Lift dogs from pivot pins (do not remove dogs from dog bracket). (5) Remove cotter pin behind connecting rod. (6) Remove washer behind connecting rod. 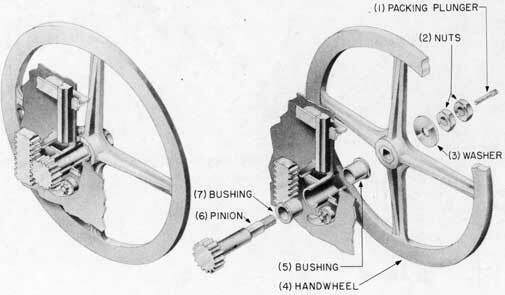 (7) Slide dog operating crank from crank spindle. (8) Inspect bushings, replace if necessary. First insert new pivot pins in operating crank, rivet pivot pins flush for loose fit. (7) Slide new operating crank on crank spindle and insert spindle in connecting rod. (6) Replace washer on connecting rod spindle. (5) Insert cotter pin in connecting rod spindle. (4) Replace dogs on pivot pins. (2) Replace nut on crank spindle, line up lock pin holes. (1) Insert lock pin through crank spindle nut. Test for easy, positive action. Fig. 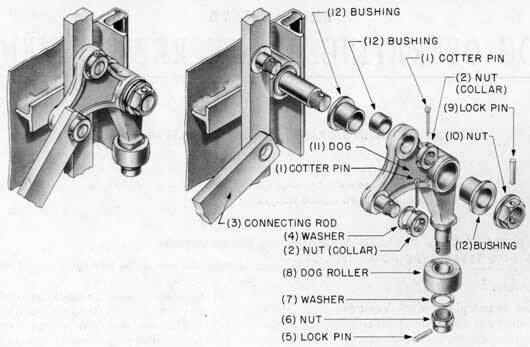 26-Dog operating crank, assembly and exploded views, Sliding Dog Lever Type Door. 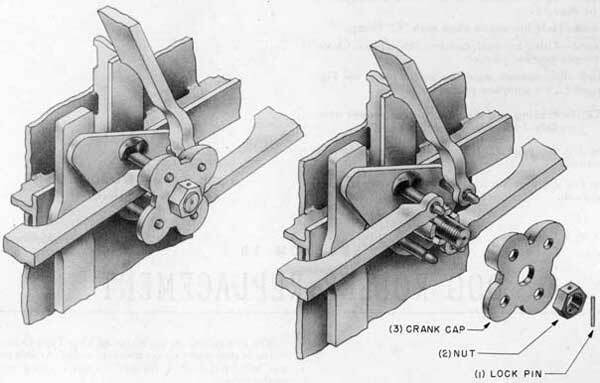 The operating crank cap is the outer hub for the operating crank pivot pins. If it is bent or damaged, it may cause binding in the dogging action. Fig. 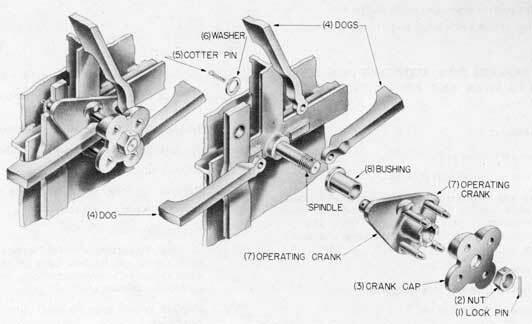 27-Dog operating crank cap, assembly and exploded views, Sliding Dog Lever Type Door. (1) Remove lock pin from dog spindle. (3) Replace new operating crank cap. Test for easy, positive operation. The dog bracket on the Sliding Dog Type Door is the guide the dog slides through. It forms the fulcrum point where the dog end is levered down on the wedge. First-Chip old bracket off door. Second-Chip clean all old weld metal from bracket seat on door. Third-Hold bracket in place with "C" clamp. Fourth-Using arc weld, tack bracket in place. Check for proper bracket position. Fifth-Permanently weld bracket in place, see Fig. 24, page 22, for complete procedure. See Fig. 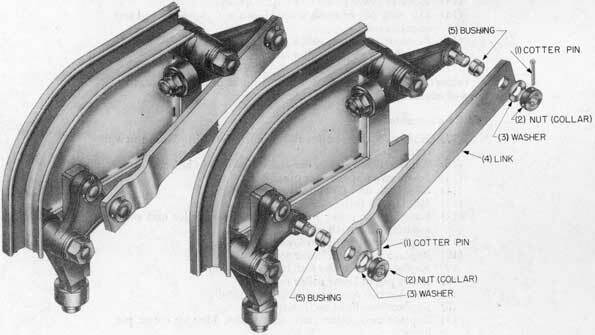 24, page 22, for bracket disassembly and re-assembly. See Fig. 15, page 13, for rubber gasket compression adjustment. Fig. 28-Dog bracket clamped in place ready for installation. The dog rollers on the Rotating Dog Type Doors revolve as they move up on the dog wedge. At this point the frictional load is reduced by the turning action of the rollers. (1) Remove lock pin from dog roller nut. (2) Remove dog roller nut. (3) Remove dog roller washer. (4) Remove dog roller and bushing as a unit. (5) Inspect bushing, renew if necessary. (4) Replace new dog roller and bushing as a unit. (3) Replace dog roller washer. (2) Replace dog roller nut, line up lock pin holes. (1) Insert lock pin through dog roller nut. Fig. 29-Dog roller assembly and exploded views, Rotating Dog Lever Type and Rack and Pinion Type Doors. 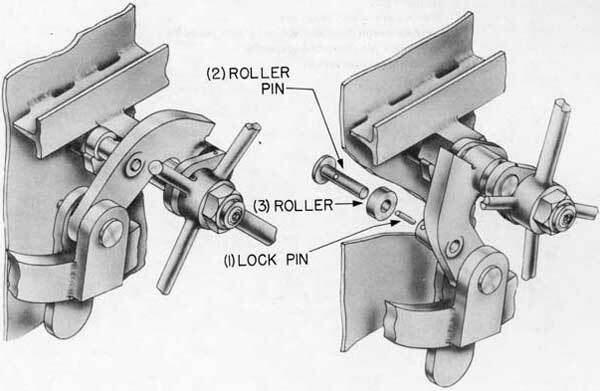 The center mechanism connecting link on the Rotating Dog Lever Type Door connects the toggle arm of the operating mechanism and the linkage system, which moves the dogs on their pivots. The link on the Rotating Dog Rack and Pinion Type Door connects the rack of the operating mechanism and the linkage system which dogs and undogs the door. (1) Remove cotter pins from link studs. (2) Remove collars from link studs. (4) Check bushings, renew if necessary. (4) Insert bushings in new link. (3) Slide new link on link studs. (2) Replace collars on link studs, line up cotter pin holes. Fig. 30-Center mechanism link, assembly and exploded views, Rotating Dog Rack and Pinion Type Door. (1) Remove cotter pins from connecting rod stud nuts. (2) Remove round nuts from connecting rod studs. (3) Remove cotter pin from clevis pin. (4) Pull out clevis pin. (5) Lift up toggle arm. (6) Slide out connecting link. (7) Check bushings, renew if necessary. (7) Replace bushings in new connecting link. (6) Slide new connecting link on connecting rod studs, holding toggle arm up. (5) Put toggle arm in place. (4) Insert clevis pin through connecting link and toggle arm, line up cotter pin holes. (3) Insert cotter pin in clevis pin. (2) Replace round nuts on connecting rod studs, line up cotter pin holes. (1) Insert cotter pins through connecting rod stud nuts. Fig. 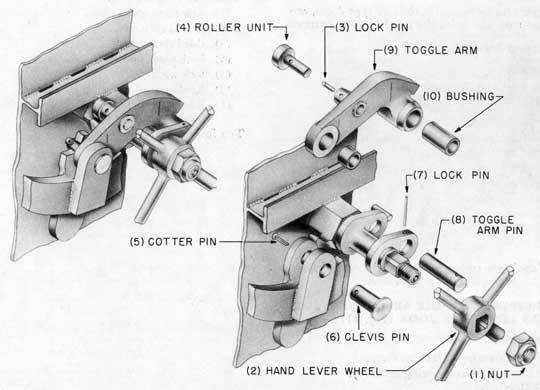 31-Center mechanism connecting link, assembly and exploded views, Rotating Dog Lever Type Door. 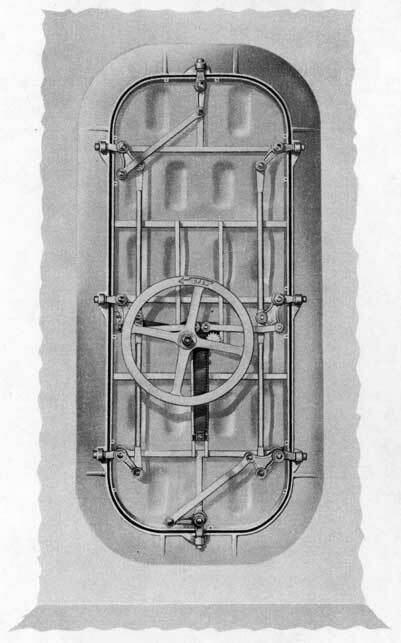 The link, on the Rotating Dog Type Doors, connects the bell crank to the dog or the bell crank to another bell crank. It is part of the linkage system that rotates each dog on its axis. The replacement of the link is practically the same for both Rotating Dog Type Doors. (1) Remove cotter pins from stud nuts (collars). (2) Remove round nuts (collars) from studs. (3) Remove washer from studs (no washers on the Rack and Pinion Type Door). (5) Check bushings, renew if necessary. (5) Insert bushings in new link. (4) Place new link on studs. (3) Replace washers on studs. (2) Replace round nuts (collars) on studs, line up cotter pin holes. (1) Insert cotter pins in round nuts (collars). Test for positive and easy action. Fig. 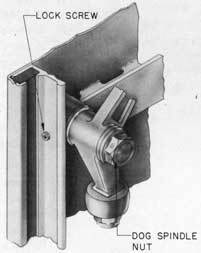 32-Link assembly and exploded views, Rotating Dog Lever Type Door. The rack on the Rack and Pinion Type Door is the gear mechanism that is moved up and down by the pinions when handwheel is turned. It actuates the linkage system that turns the dogs. (1) Remove two handwheel nuts. (2) Remove washer from handwheel spindle. (3) Slide off handwheel, pinion and bushing unit. (4) Remove two cotter pins from link spindles. (5) Remove two collars from link spindles. (6) Lift over two links. (7) Remove four spacers from link spindles. (8) Remove pin from lower roller nut. (9) Remove lower roller nut. (10) Remove washer from lower roller bolt. (11) Remove spring clip from lower roller bolt. (12) Pull out lower roller bolt (lift rack out of mesh with pinion). (13) Remove lower roller and bushing unit. (14) Lift rack out of mesh with pinion and move up and out of roller track. (15) Remove two upper roller pins. (16) Remove two upper roller studs. (17) Remove two upper roller and bushing units. Inspect roller bushings, link bushings and pinion bushing, renew if necessary. (17) Hold two upper roller and bushing units in place in new rack. (16) Replace two upper roller studs, line up pin holes. (15) Insert two upper roller pins. (14) Slide rack unit down into roller track. (13) Hold lower roller and bushing unit in place. (12) Insert lower roller bolt through lower roller and rack, meshing rack with pinion. (11) Replace spring clip on lower roller bolt. (10) Replace washer on lower roller bolt. (9) Replace lower roller nut, line up pin holes. (8) Insert pin in lower roller nut. (7) Replace two spacers on each link spindle. (6) Replace two links on link spindles. (5) Replace two collars on link spindles. Line up cotter pin holes. (4) Insert and open two cotter pins. (3) Replace handwheel, pinion and bushing unit. (2) Replace washer on handwheel spindle. (1) Replace two nuts, pull tight. Grease pinion and rack teeth with rust-inhibitive grease and test for smooth operation. Fig. 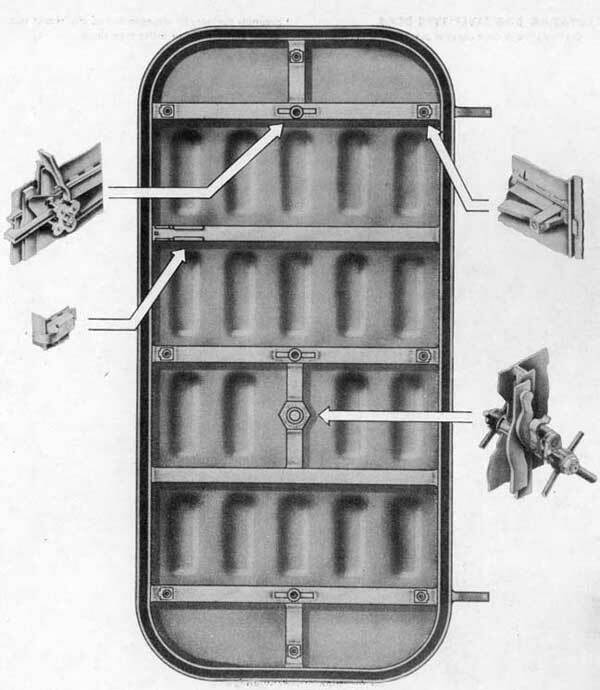 33-Rack, assembly and exploded views, Rack and Pinion Type Door. The interlock latch on both lever type doors locks and unlocks the operating mechanism. When the door is open, the dogs are prevented from being moved beyond the edge of the door. When the door is closed, the interlock latch slides on the side of the door frame knife edge, lifts up and unlocks the dogging mechanism. (1) Remove cotter pin from latch and latch pin. (3) Lift off interlock latch. (4) Replace spring. Hold spring on spring pin (5). (3) Replace interlock latch (make sure spring pin on latch is seated in spring). (1) Insert cotter pin through latch and latch pin. Close door and check for unlocking action. Open door and check for locking action. Fig. 34-Interlock latch, assembly and exploded views, Sliding Dog Lever Type Door. The interlock trigger on the Rotating Dog Rack and Pinion Type Door moves the interlock rod that drops the interlock pawl in and out of the pinion teeth. When the door is closed, the trigger moves on the side of knife edge, pushing the interlock rod in, rotating the pawl on its axis and pulling the pawl out of the teeth of the pinion, unlocking the dogging mechanism. (1) Unhook spring from pawl. (2) Remove cotter pin from pawl spindle. (3) Remove washer from pawl spindle. (4) Slide pawl off spindle and pull out entire interlock assembly. (5) Drive out trigger pin. (6) Hold new trigger in place. (5) Insert trigger pin and drive home. (4) Slide entire interlock assembly in place and slide pawl on pawl spindle. (3) Replace washer on pawl spindle. (2) Insert cotter pin in pawl spindle. (1) Hook spring to pawl. Open and close door to test for locking and unlocking action. Fig. 35-Interlock trigger, assembly and exploded views, Rotating Dog Rack and Pinion Type Door. The pawl is the hook, on the Rack and Pinion Type Door, that drops into the teeth of the pinion when the door is open, preventing the dogs from being turned beyond the edge of the door. (6) Slide pawl off spindle. (6) Slide new pawl on spindle. Fig. 36-Pawl, Rotating Dog Rack and Pinion Type Door. The inside and outside handwheel pinions, on the Rack and Pinion Type Door, are both geared to the rack. Turning either handwheel moves the rack up and down, actuating the linkage system. This gearing system reduces the power necessary to operate this type of door. (2) Remove two nuts from pinion shaft. (3) Remove washer from pinion shaft. (4) Slide outside handwheel off pinion shaft. (5) Remove bushing, renew if necessary. From inner side of door. (7) Remove bushings, renew if necessary. (4) Slide outside handwheel on pinion shaft. (3) Replace washer on pinion shaft. (2) Replace two nuts, pull tight. (1) Renew packing and replace packing plunger, see Fig. 14, page 12. Grease pinion teeth with rust-inhibitive grease. Fig. 37-Outside handwheel pinion, assembly and exploded views, Rack and Pinion Type Door. (1) Remove two nuts from handwheel shaft. (2) Remove washer from handwheel shaft. 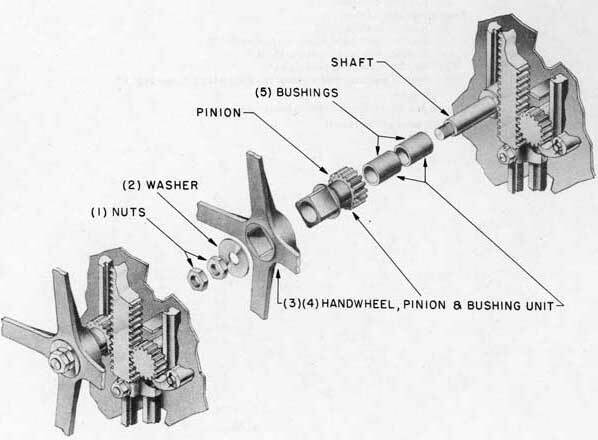 (3) Slide from shaft, handwheel, pinion and bushing unit. (4) Remove pinion and bushing unit. (5) Remove bushings, renew if necessary. (5) Insert bushings in new pinion. (4) Insert pinion and bushing unit in handwheel. (3) Slide handwheel, pinion and bushing unit on handwheel shaft. (2) Replace washer on handwheel shaft. (1) Replace two nuts on handwheel shaft, pull tight. Grease teeth of pinion with rust-inhibitive grease. Fig. 38-Inside handwheel pinion, assembly and exploded views, Rack and Pinion Type Door. Failure of door parts through normal wear, injury, corrosion and battle damage make it necessary to replace parts at sea. At times it may even be necessary to fabricate a part aboard ship. To meet such an emergency, specifications and heat treatment of parts are covered in Section 26 and detailed drawing numbers are given in the Spare Parts Lists in this section. If parts are not available and must be ordered from the manufacturer, the name and type of ship and the number of the door opening will facilitate the order as all door openings and their doors are on file with the manufacturer. connecting rod cotter pin 59914 Everdur Comm. connecting rod washer 54282 Stl. SH Comm. dog operating crank cap-R.H. 58964 Y Brass Comm. dog operating crank cap-L.H. 58965 Y Brass Comm. dog pivot pin 58962 .13CH.S.Stl. dog set screw 59963 Stl. SH Comm. dog set screw lock screw 58511 Stl. SH Comm. gasket, rubber D-32666 Rubber Comm. hinge washer 47482 Comm.Brass Comm. interlock latch cotter 59914 Everdur Comm. toggle arm spring lock washer C-61045 Soft brass Comm. NOTE: Reference Drawings, Sliding Dog Lever Type Door. TITLE HEINTZ NO. TITLE HEINTZ NO. 39000 Hand lever assembly, 15"
46454 Hand lever assembly, 12"
49506 Hand lever assembly, 18"
58519 Dog slider bar, side, 30"
58582 Dog slider bar, side, 18"
58583 Dog slider bar, side, 21"
58584 Dog slider bar, side, 22"
58585 Dog slider bar, side, 24"
58586 Dog slider bar, side, 26"
58587 Dog slider bar, side, 36"
58588 Dog slider bar, side, 42"
58598 Dog slider bar, side, 20"
65739 Dog slider bar-end 15"
70353 Dog slider bar-end 10"
connecting link washer 54284 Stl. SH Comm. connecting rod stud pin 53737 Stl. Galv. Comm. connecting rod stud washer 54353 Stl. SH Comm. dog, rotating roller washer 54281 Stl. SH Comm. Gasket, rubber 1/2" x 1 1/4" D-32666 Rubber Comm. 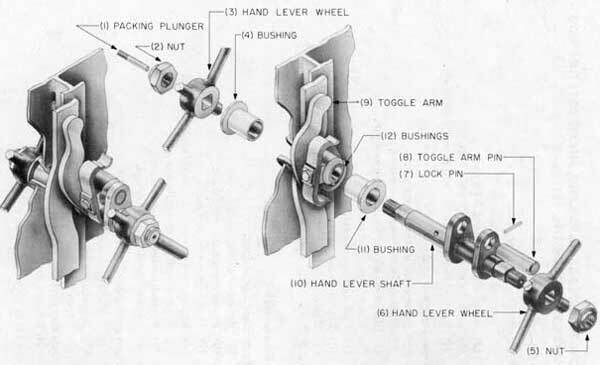 hinge adjusting yoke hex. nut 60449 Comm. brass Comm. hinge cotter pin 5/32" x 2" 78211 C.R.S. Comm. 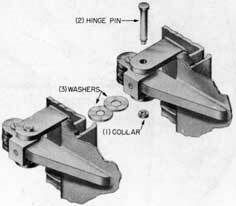 hinge washer 75748 Comm. brass Comm. hinge washer 20896 Comm. brass Comm. hinge washer 76568 Comm. brass Comm. interlock cotter pin 3/32" x 1 1/8" 59342 Stl. EG Comm. interlock trip stop plate rivet 68116 Steel Comm. link bell crank to dog, washer 54283 Stl. SH Comm. stop pin mach. screw (12-24 x 5/8") 64918 Stl. EG Comm. NOTE: Reference Drawings Rotating Dog Lever Type Door. D-32666 Gasket, rubber, 1/2" x 1 1/4"
38450 Connecting link, right hand 26"
38451 Connecting link, left hand 26"
38452 Connecting link, plate 24" to 30"
38462 Toggle arm, R. H. 24" to 36"
38463 Toggle arm, L. H. 24" to 36"
38468 Toggle arm roller cam 24" to 26"
C-46195 Toggle arm roller cam 30" to 36"
46241 Connecting link, L. H. 36"
46242 Connecting link, R. H. 36"
46243 Connecting link plate 36" & 42"
E-46865A Dog, rotating, L. H.
E-46866A Dog, rotating, R. H.
47478 Connecting link, R. H. 30"
47479 Connecting link, L. H. 30"
49506 Hand lever assembly 18"
C-49561 Toggle arm roller cam 42"
49562 Toggle arm R. H. 42"
49563 Toggle arm L. H. 42"
52410-B Dog, rotating wedge, R. H.
52411-B Dog, rotating wedge, L. H.
54273 Toggle arm locking pin 1/8" x 7/8"
54274 Toggle arm locking pin 1/8" x 1 1/2"
58878 Connecting link, R. H. 24"
58879 Connecting link, L. H. 24"
59342 Interlock cotter pin 3/32" x 1 1/8"
connecting rod stud cotter pin C-25126 Brass Comm. Gasket, rubber IA" x 1%" D-32666 Rubber Comm. handwheel spindle washer-inside C-36219 Felt Comm. interlock cotter pin C-30062 Brass Comm. light, fixed gasket-outside C-32689 Rubber Comm. NOTE: Drawings Covering the Rotating Dog Rack and Pinion Type Door. PHYSICAL Tensile strength 130,000 #/sq. in. min. Elongation in 2 inches 2.0% min. PHYSICAL Tensile strength 45,000 #/sq. in. min. Yield point 25,000 #/sq. in. min. PHYSICAL Tensile strength 60,000 #/sq. in. min. PHYSICAL Tensile strength 22,000 #/sq. in. min. Elongation in 2 inches 6.0% min. PHYSICAL Tensile strength 32,000 #/sq. in. min. Yield strength (set = 0.2%) 25,000 #/sq. in. min. Elongation in 2 inches 16% min. PHYSICAL Tensile strength 58,000 #/sq. in. min. Yield point 26,000 #/sq. in. min. Copper, tin & phosphorus total 99.0% min. PHYSICAL Tensile strength 80,000 #/sq. in. min. Yield strength 60,000 #/sq. in. min. PHYSICAL Tensile strength 70,000 #/sq. in. min. Yield point 35,000 #/sq. in. min. Elongation in 2 inches 15.0% min. PHYSICAL Tensile strength 90,000 #/sq. in. min. Elongation in 2 inches 20.0% min. Other elements 0.25% each max. Yield point 34,000 #/sq. in. min. PHYSICAL Proof stress 22,000 #/sq. in. min. Tensile strength 75,000 #/sq. in. min. Elongation in 2 inches 35% min. PHYSICAL Proof stress 35,000 #/sq. in. min. Tensile strength 70,000 #/sq. in. min. Elongation in 2 inches 25% min. Brinell hardness number 202 max. PHYSICAL Tensile strength 75,000 #/sq. in. min. Elongation in 2 inches 40% min. Reduction in area 50% min. Yield point 37,000 #/sq. in. min. PHYSICAL Tensile strength 65,000 #/sq. in. min. PHYSICAL Tensile strength 93,000-99,000 #/sq. in. min. Yield point 58,000-60,000 #/sq. in. min. PHYSICAL Tensile strength 93,000 #/sq. in. min. Yield point 58,000 #/sq. in. min. Yield point 40,000 #/sq. in. min. PHYSICAL Tensile strength 69,000 #/sq. in. min. Yield point 47,000 #/sq. in. min. PHYSICAL Tensile strength 67,000 #/sq. in. min. PHYSICAL Tensile strength 99,000 #/sq. in. min. Yield point 60,000 #/sq. in. min. PHYSICAL Tensile strength 80,000-90,000 #/sq. in. min. Yield point 35,000-45,000 #/sq. in. min.